I couldn’t make it to see wood sculptor Jeff Soan’s latest exhibitions, and so he very kindly sent me this little fish, to give me more of an idea of how his work moves in the flesh. As he said, it is “part of the pleasure”. I know that I am always getting very excitable about the work that I feature here – that’s not only because I only choose to write about things that do genuinely interest me, but also because these really are, in my opinion, something very special. Made from ash, this little fish sits lightly in my palm, and with each movement of my hand, it bends and moves as if it is alive. Each little cut into the wood is so precise, the design so perfect and true. The finish is truly lovely, a mix of scarred and darkened wood, bright shimmering greens and polished amber hues. Jeff says that he prefers to use spray paint to decorate these fish – applied through, of all things, fishnet tights – a happy discovery one day when looking for a perfect way to mimic the texture of fish scales. He follows the arrangement of the annual rings in the wood, finding beautiful curves and circles which form part of the design. Patterns and natural forms are then brought to life by tried and tested combinations of torching, digging in, spraying and sanding, until the desired effects are reached. Torching the wood not only gives a beautiful dark sheen, but lends the piece an extra special sensory value, as it smells so beautifully of wood smoke! Jeff also says that as the wood is torched, it naturally forms into scales, the pattern deepens in. This little fish sparkles like real scales do, in the light. By cutting the wood into narrow sections, and securing it to canvas, Jeff enables the most amazing movement into his creatures. 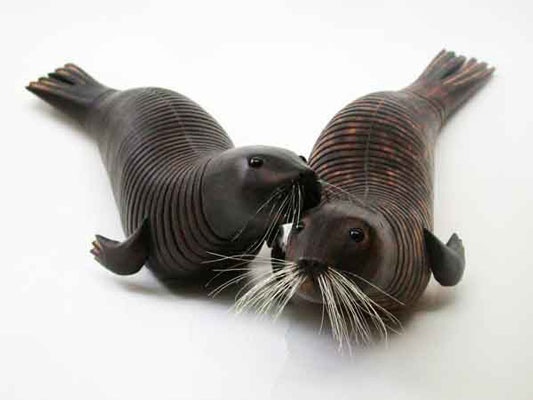 These beautiful seals, one of his most popular creations, will curl and move to your touch, gazing up at you in such a soft eyed, lifelike way that it’s almost unnerving! As you move the handle, the dog moves and wiggles, wagging its tail. It was, as Jeff describes, “a bit of a disaster really.. I am rubbish at automata”. But I think that its clunky nature and slight aura of embarrassment is totally part of the charm. Jeff prefers to work with reclaimed wood. He tries to use every part of it, so that for example, he says “the offcut portion of a fishes tail may form the breast of a bird.” He says that he particularly enjoys working with partially rotted wood, which, once microwaved and cleaned to stop the rot and remove any hidden residents, gives way to wonderful naturally formed raised areas, textures, and colours. He rarely uses traditional tools, preferring to make use of many usual and unusual implements in his self titled pursuit of “wood butchery”. Rotary carving tools, blowtorches, wire brushes and even meat tenderisers are some of his preferred items to hand. “I’ve got used to power” he says, talking of his tools, and, with a certain mix of both guilt and pride, “I abuse wood horribly”. Recently, Jeff was given some of the original timber from the Cutty Sark, and asked to make creatures that would have been found on and around the ship. The lovely Collie above is made from oak, and the collar made from the original hull planking. 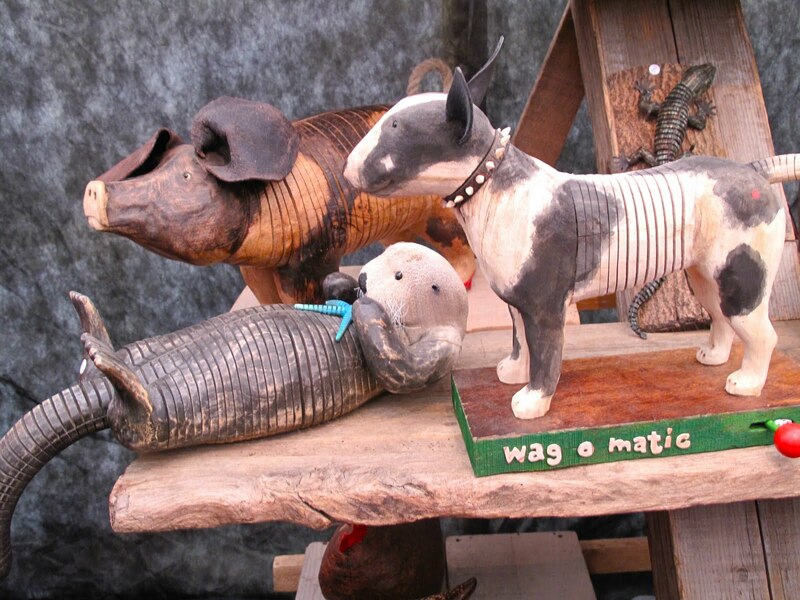 He is modelled on the dog kept by the aptly named Captain Woodget, who sailed the Cutty Sark during her most successful period of service in 1885. Captain Woodget sounds like a fascinating character, who Jeff tells me was known for his habit of roller skating on deck! The powdery, matt black finish is achieved by painting with an iron solution, which creates a really natural looking colour that is actually created in the fibres of the wood, rather than sitting on top. This is painted or sprayed in. I love the effect. This, other animals, and even a small automata of the ship, made from offcuts from a mixture of timbers, will be on display at the re-launch. I asked him what inspires him to continue to work in wood in this way. He answered, “I don’t really know why I keep doing this..sometimes I just think, what’s the point, so what?” But then he tumbles into an excited run of sentences about this experiment and that, new techniques he has learned, new things that fascinate him, and it is obvious that this is still a love to him, these are not just run of the mill offerings..I think this is immediately evident in the objects themselves, which fizz with energy and life – this is true passion, and true, grown skill, from a real craftsman. You can find Jeff’s website and blog here.